*Home day care – usually offered by a stay at home parent hosting a few children in their home (often along with the care givers own children). Usually the hours are more flexible and with a smaller group of children however you need to ask what happens if the care giver gets sick – their own children get sick – of unforeseen circumstances mean the person is unable to look after your child that day or for a few days or weeks. *A nanny – either a live in or live out nanny offers both flexibility and convenience – in home care keeps your child in their usual environment, and if your child gets sick you don’t have to take time off work to care for them. On the downside if the nanny herself is ill you have no back-up and your child will need organised play-dates or similar to get to experience a more social environment. Other child care options include having a neighbour, friend or family member look after your child – even perhaps one or two days a week. 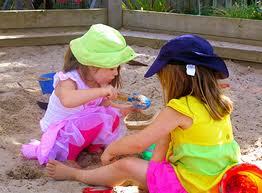 Whatever child care option you decide on you also need to consider do they share the same child rearing ideas as you? Take time to talk to others who use the day care provider, ask to see any references or licences, and ask lots of questions about their child rearing philosophy. Once you have made a choice see how the child reacts to the day-care environment – are they happy with the care giver and – or – the day care environment? If you have decided to try a nanny or in home care there are a few questions you could consider asking – How do you feed babies? Do you smoke? How do you sooth a crying baby? Do you have a first aid certificate? Do you know CPR? How do you discipline a child? What’s the best way to get a child to sleep? If you have decided on a day care facility some questions you could consider asking include – are all the staff trained in childhood development? Can you visit your child during the day? What if you are running late to pick up your child? What are the child to child care worker ratios? Ultimately you just want the best for your child, so do *shop around*. How do you feel about childcare? Did you become a stay at home parent? Did you have to go back to work and if so how did you search for suitable childcare? If you have any extra advice or tips to share – we’d love to hear from you.